Mardi 20 septembre @ Senior Languages, Tanglin Trust School. L’APFS organise le premier tour des premières Joutes Oratoires de Singapour. Des élèves de TTS, UWC (East et Dover), SAS et GESS y participeront. 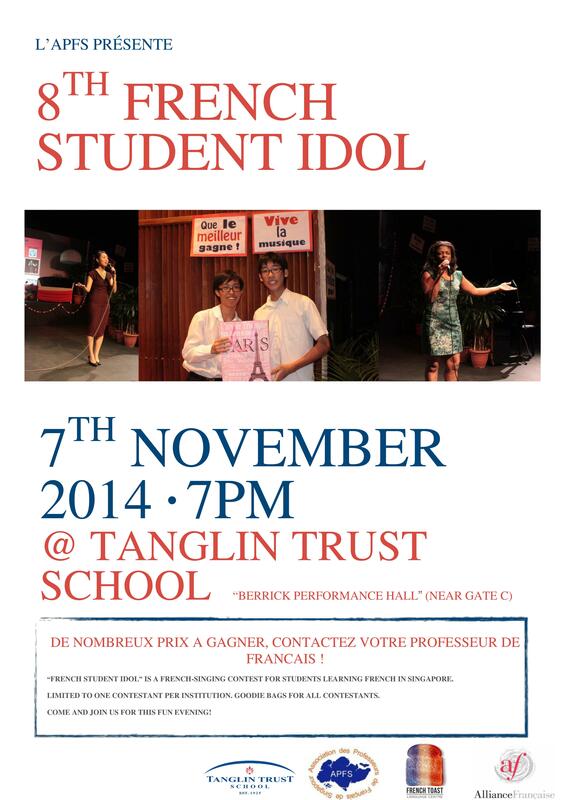 French Idol was hosted by Tanglin Trust School on Friday, 7 November. It was organised by the APFS (www.apfs.sg) and sponsored by Senteurs de Provence, L’Alliance Française and Singtheatre. The time has come to choose singers for French Idol 2014. This year, the competition will take place on the 7th November at Tanglin Trust School at 7pm in the Berrick Performance Hall. A variety of singers from different institutions around Singapore will compete for a number of prizes. If you would like to compete, please get in touch here. See here and here for videos of last year’s outstanding evening. Les enfants peuvent venir à partir de 12 ans.